BELLVILLE — Clear Fork’s opponent in Week 1 of the high school football playoffs is certainly battle-tested, having met up with three playoff teams already this season. The 7-3 Bryan Golden Bears enter Saturday’s game at the Colt Corrall with a 7-3 mark, but shouldn’t be taken lightly, having already faced 2018 playoff teams Patrick Henry, Liberty Center and Van Wert. The undefeated Colts are 10-0 and won the Mid-Ohio Athletic Conference championship for the second-straight year, in their second year in the MOAC. It also is Clear Fork’s second-straight playoff appearance and second straight 10-0 regular season mark. Presale tickets for Saturday’s Clear Fork vs. Bryan first-round playoff game will be on sale 8 a.m. to 2:30 p.m. daily, starting Tuesday, at the high school office. All tickets sold early will cost $8. Tickets sold at the gate on Saturday cost $9, and everyone will be required to have a ticket to get into the game. Per Ohio High School Athletic Association rules, no season tickets nor senior citizen passes will be honored for OHSAA playoff or tournament games. The gates will open Saturday at 5:45 p.m. The game begins at 7 p.m. The Golden Bears come into the playoffs with a 7-3 overall record. They were 4-3 in the competitive Northwest Ohio Athletic League, having lost conference games to league champion Patrick Henry (28-13), second-place Liberty Center (28-24) and their season opener to Van Wert (34-7). Patrick Henry (7-3 overall) also is in the playoffs, as are Liberty Center (9-1 overall) and Van Wert (8-2). The Golden Bears averaged 25.7 points a game this season, while giving up 16.9 points. Bryan was led on offense by quarterback Nate Miller. Through nine games, Miller rushed for 516 yards on 142 carries. But Miller was the top passer in the NCOAL, completing better than 62 percent of his passes (113 of 181) for 1,413 yards, 12 TDs and five interceptions. Bryan had three receivers (through nine games), with more than 20 receptions, led by Brycen Andrews, with 35 catches for 476 yards and four touchdowns. 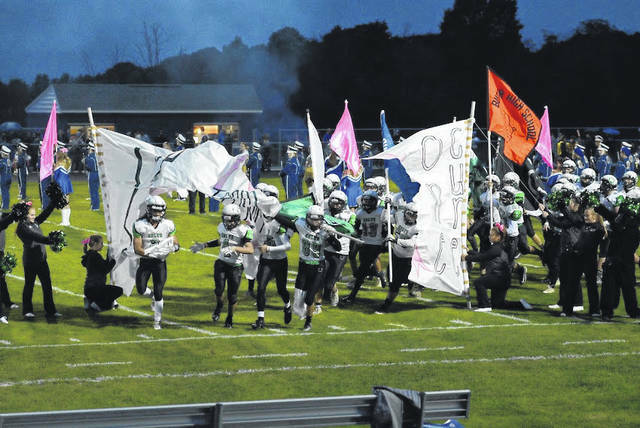 Clear Fork averaged 46.9 points per game this season, while giving up just 11.9 points per game. Their attack is balanced — very balanced — with multiple weapons on the ground and via the pass. MOAC foe Pleasant, which lost 16-14 to Clear Fork in Week 9, also qualified for the playoffs. The Spartans are at Oak Harbor, also at 7 p.m. Saturday.